Why I’m a Christy Martin Fan! I watched the Christy Martin – Dakota Stone fight last night*. Christy put on a F I E R C E performance, matching the much younger Dakota Stone and then some, not to mention putting her down on the canvas for an eight-count with a classic Left-Right combination that was letter perfect. By now you likely know that Christy broke her right hand during the 4th round — and proceeded to fight much of the 5th round with her left — only to have the fight stopped in the 6th and final round after throwing the right hand once too often and absorbing some punishment as well putting her into a world of hurt. 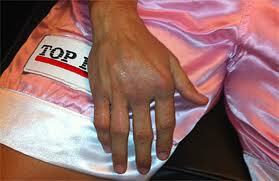 At that point, the Ringside doctor called the Ref over who stopped the fight giving Dakota Stone the TKO and the win. The shame of it was Christy was ahead on all three cards and would have won the battle. What really wowed me was Christy’s TRUE warrior spirit. 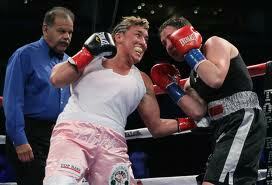 She came out swinging and never stopped even as she took some punches in the 3rd round that clearly rocked her a bit. She also worked combinations through out, throwing jab-jab-rights and mixing them up with body blows, upper-cuts, overhand rights and more jabs. There are a lot of younger, slicker boy-boxers that could learn a thing or two or three from Martin’s performance, not the least of which is old-school true grit. I applaud Christy’s tenacity and spirit — even as I hand it to Dakota for garnering the win. Whatever happens to Christy next, she can count this girlboxer as a friend and a fan for life — ’cause let me tell you, she earned it. * I could only watch the first four rounds and the beginning of the fifth before the webcast signal died (subject for another night I think — Why aren’t women’s bouts being broadcast on television?!?!?). I saw some of the rounds on YouTube; it was some incredible work by Martin (and Stone, but I was watching Martin). I was particularly amazed at the left hand work she did after the initial injury. But I totally understand how she threw that right again — it’s just so instinctive; I’ve had it happen on my (very minimal) pad work with trainers — they call a couple of shots and you throw one more, just because it’s loaded and you work so much on instinct. So I agree with you. I wasn’t thrilled that they did a Stone-Martin rematch, since I wanted to see a different challenger for Christy, but there’s absolutely no doubt that she showed true warrior spirit. Christy’s lefts really were amazing! And its one thing to work on it in the gym shadow boxing or on the focus pads, but something else again in the ring against an opponent — WITH A BROKEN RIGHT HAND!!! What an amazing person. She is what boxing is all about – heart. i still don’t know why HBO does not show women’s matches, I was there as media, and to me, it was one of the best fights of the evening. I agree, if the ref let Christy finish the last minute, she would have probably won by 1 point. I have a copy of the judges score cards, and if the fight did go the distance (saying Christy lost the 6th round by 10-9) she would have probably won 57-56. She was begging the ref to stay in the fight – it looked to me that she was repeatly saying “Please,Please.” To give Stone a little praise, she looked in better shape than Martin going into the fight, and she took some very hard punches. Nevertheless, I would like to see a rematch. Thanks for your comment — and so nice to read that you saw the same thing ringside. And you’re right, Stone was in good shape, the difference for me was Christy’s ring savvy, plus those amazing lefts. Given that she’d not fought in a long time — never mind having physically come back from the trauma of being shot, knifed and beaten, she showed the kind of heart that is one in a million. As for why HBO didn’t broadcast it, I’m frankly stymied. There are a LOT of terrific female pro’s out there with great skills, stamina and heart, so I’m with you, it makes no sense. It also should be noted that women’s bouts are consistently well attended with a loyal and growing fan base — surely this must count for something. Meanwhile, women’s MMA bouts are being broadcast … perhaps that’ll help push the cable stations to broadcast boxing as well. Actually Stone is not much younger than Martin. And, this is the second time Martin has broken her hand on Stone’s face. You have to wonder about Martin’s skills when she’s done that twice. I know she’s been through a lot and I feel for her, but Stone seems like the better boxer to me.